Join us for our newest workshop in our Musical Theatre department at CPSM for 10 weeks this Spring Semester starting Sunday, March 5th. 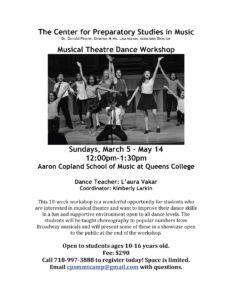 The Musical Theatre Dance Workshop is the perfect opportunity for students ages 10-16 interested in theatre to work on their dance skills. Open to all levels. For more information, please call us at (718) 997-3888.